I hope you will join our global family as we enter 2014 together during Turnover 2013-2014. As the Hands at Work family prays together across the world, we will thank our Heavenly Father in unison. His faithfulness has allowed us to serve Him fruitfully in 2013. Together, we will pray for 2014 and commit the new year to building His Kingdom as we serve the most vulnerable children in Africa. We will start praying when it is 00:01 on Wednesday January 1, 2014 in Sydney, Australia. 2) Pray for 15 minutes in unity, thanking God for His faithfulness in 2013, and asking Him to lead Hands at Work in 2014. Two of the most vulnerable children in Mozambique. A church leader from Canada and a local Hands at Work leader visit a young person at his home in South Africa. 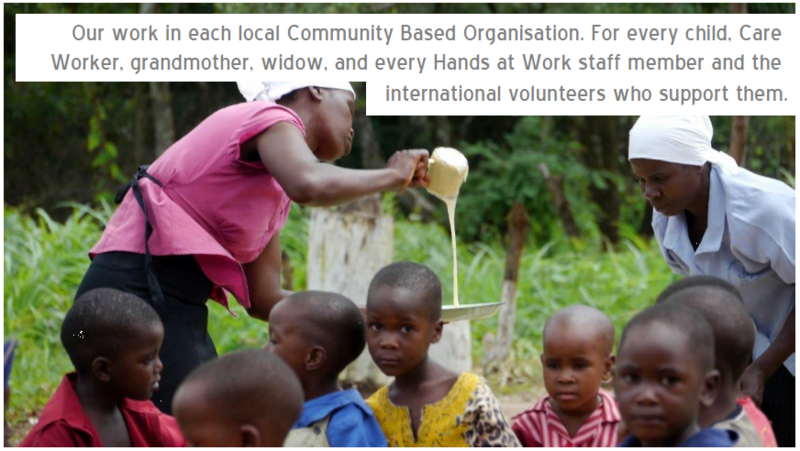 A current member of the Hands at Work Maintenance Team participates in a workshop in Zimbabwe with Care Workers, children, and other local leaders. Many of the Hands at Work family members together at the Hub in South Africa. Care Workers provide a daily nutritious meal for the most vulnerable children in their community. One of the poorest communities in Mozambique where Hands at Work plans to expand in 2014. International Volunteers from all over the world together in Zambia in April 2013. Hands at Work family from across Africa and around the world, standing together in prayer in Zambia, April 2013. Join us in thanks and prayer from wherever you are. Let us Turnover to the new year together.